Centre launched a programme to reduce particulate matter (PM) pollution by 20-30% in at least 102 cities by 2024. National Clean Air Programme (NCAP) is scheme to provide the States and the Centre with a framework to combat air pollution. It is a five-year action plan with a tentative target of 20-30% reduction in concentrations of PM10 and PM2.5 by 2024, with 2017 as the base year. It is a ₹300-crore programme. In 2018, 14 of the world’s 15 most polluted cities were in India. Tier I and Tier II Indian cities are some of the most polluted places in the world. A study in the journal Lancet ranked India as No.1 on premature mortality and deaths from air pollution. Cabinet approved setting up of 3 All India Institutes of Medical Sciences in Jammu and Kashmir and Gujarat. These will be in Samba in Jammu at a cost of ₹1,661 crore, in Pulwama in Kashmir at a cost of ₹1,828 crore, and in Rajkot, Gujarat, at a cost of ₹1,195 crore. The institutes will be set up under the Pradhan Mantri Swasthya Suraksha Yojana. The Pradhan Mantri Swasthya Suraksha Yojana (PMSSY) aims at correcting the imbalances in the availability of affordable healthcare facilities in the different parts of the country in general, and augmenting facilities for quality medical education in the under-served States in particular. The scheme was approved in March 2006. The first phase in the PMSSY has two components – setting up of six institutions in the line of AIIMS; and upgradation of 13 existing Government medical college institutions. In the second phase of PMSSY, the Government has approved the setting up of two more AIIMS-like institutions, one each in the States of West Bengal and Uttar Pradesh and upgradation of six medical college institutions. In the third phase of PMSSY, it is proposed to upgrade the existing medical college institutions. There has been a steady increase in crimes committed against children in Kerala. Government officials are attributing this to increased reporting of crimes because of better awareness, but social workers contend that crimes against children have indeed increased. Constitution 124th Amendment Bill, 2019 dealing with creating a 10% quota for the economically weaker sections (EWS) does not require ratification by Legislative Assemblies. As per the Article 368, an amendment to a fundamental right coming under Part III of the Constitution need not be sent to the States’ Legislative Assemblies for ratification. 124th CA Bill adds new clauses to Articles 15 and 16 of the Constitution. The new clause (6) to Article 15 allows the government to carve reservation for the economically weaker sections of society in higher educational institutions, including private ones, whether they are aided or not by the State. Minority educational institutions are exempted. Likewise, the new clause (6) to Article 16 provides for quota for economically deprived sections in the initial appointment in government services. As per the experts, economic reservation law is open for judicial review. The Constitution does not provide for economic reservation. The Indira Sawhney judgment has capped the reservation limit to 50%. Now, the new Bill increases reservation to 60%. In the judgment, the Court had held that economic backwardness cannot be the sole criterion for reservation. Part of: GS Prelims and Mains III – Government policies and programmes; Indian Economy and issues related to it. GST Council decided on a series of measures that will ease the tax and compliance burden for small businesses. Henceforth, companies with annual turnover up to ₹40 lakh will stay out of the GST net (₹20 lakh earlier). The annual turnover limit for eligibility for the Composition Scheme has also been raised to ₹1.5 crore from April 1. The increase in limit would allow about 10 lakh traders to be exempt from the GST compliance burden. The GST Council also decided to allow Kerala to levy a cess of up to 1% for up to two years on intra-State supplies to help finance the disaster relief efforts following the recent floods in the state. Shutdown has been called in Assam against the Centre’s move to grant Scheduled Tribe status to six “advanced” communities — Chutia, Motok, Moran, Koch-Rajbongshi, Tai-Ahom and Tea Tribes/Adivasis — which are currently categorised as Other Backward Classes. Indian Navy has successfully tested containers that can be air-dropped to enhance its operational logistics capability at sea. These cylindrical containers have been indigenously developed by the Naval Science and Technological Laboratory and the Aeronautical Development Establishment of the Defence Research and Development Organisation. Mechanisms, laws, institutions and Bodies constituted for the protection and betterment of these vulnerable sections. Social justice and Empowerment of vulnerable sections of the society. Who qualifies for the proposed quota? What would it take for the quota to become reality? Why current 10% quota for EWS is in violation of equality norm? Why instead of addressing inequality, the 10% quota for economically weaker sections creates huge anxieties? Article 340 mandates that the government identify “classes” which were “socially and educationally backward”, and implement measures “to remove such difficulties [so] as to improve their condition”. Article 15 (prohibition of discrimination) and Article 16 (equality of opportunity) needs to be amended. Article 15(4) empowers the State to “make any provision for the advancement of any socially and educationally backward classes of citizens or for the Scheduled Castes and Scheduled Tribes. Article 16(4) provides “for the reservation of appointments or posts in favour of any backward class of citizens, which in the opinion of the State, is not adequately represented in the services under the State”. The term “backward class of citizens” has been generally understood to include the SCs, STs, and Socially and Educationally Backward Castes (SEdBCs). Due to deep inequalities prevalent in access to education and jobs based on caste and socio-economic status. Also to correct deprivation forced upon them by centuries of prejudice. Therefore, affirmative action (or positive discrimination) makes a lot of sense. The quota is targeted at economically weaker sections among the upper castes. General category individuals, all members of whose family together earn less than Rs 8 lakh per annum, and who have less than five acres of agricultural land, will qualify. Individuals whose families own or possess more agricultural land, or a residential flat of area 1,000 sq ft or larger, or a residential plot of area 100 yards or more in notified municipalities and 200 yards or more in areas other than notified municipalities, will not qualify. Criteria 1: According to one criteria mentioned in the Bill, those that are currently applied to the definition of the Other Backward Classes (OBC) creamy layer are the ones to be used. We know that, OBC creamy layer has been created to exclude people who are clearly well off, however, the EWS quota, in contrast, is expected to focus on the poor. It is not clear how useful they would be. According to National Sample Survey (NSS) of 2011-12, the annual per capita expenditure for 99% of households falls under this threshold, even when we take inflation into account. Even as per the India Human Development Survey (IHDS), the annual household incomes of 98% of households are less than ₹8 lakh. Even after applying all these criteria for exclusion, the Bill would still cover over 95% of the households. Therefore, who are excluded from the reservation? Almost no one. While the benefits of the EWS quota are likely to be minimal, the cost may be higher than one anticipates. We know that, the additional reservation will mean upping the reservation quota to 60%. It is important to remember that general category jobs are open to everyone, including Scheduled Caste (SC), Scheduled Tribe (ST) and OBC individuals. Thus, by removing 10% jobs from the “open” category, it reduces the opportunities for currently reserved groups. For instance, consider OBC individuals. OBC reservation is limited to 27% of the seats whereas the OBC population is more than 40% of the population. Now the remaining individuals have to compete with 40% open category instead of 50%. Actual implementation of the EWS quota could be challenging. Already, a large number of SC/ST/OBC households report difficulties in obtaining these certificates. Now large section of people would require caste certificates. This is an era where skill demands are rapidly outpacing supply of candidates in specialised fields, therefore, the EWS quota increases the constraints. There is a need for an enhanced and more effective reservation policy so that we can genuinely see an end to the entrenched inequalities in Indian society in the medium term. We need effective solutions that would make reservations redundant in 50 years. On one hand, 50% reservation looks very large; however, in the grand scheme of India’s population it is a blunt and at times ineffective instrument. 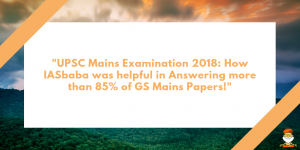 There has been increase in large number of SCs taking the civil services examination with the perception that it is easier for SCs to be recruited via the reserved quota. However, statistics from the Union Public Service Commission provide a sobering view of ground realities. In 2014, only 0.14% applicants to the UPSC were selected. Moreover, the general category and OBCs have the highest success rate, about 0.17%, and SCs have the lowest, about 0.08%. The % of SC candidates who made it past the preliminary examination is also less compared to other category candidates. One might say that many of these candidates are not qualified for these jobs. Spread the benefits of reservations as widely as possible within the existing framework and ensure that individuals use their reserved category status only once in their lifetime. This would require that anyone using reservations to obtain a benefit such as college admission must register his/her Aadhaar number and she would be ineligible to use reservations for another benefit (e.g. a job) in the future. Focus on basic skills: It is important to recognise that future economic growth in India is going to come from the private sector and entrepreneurship. In order to ensure that all Indians, regardless of caste, class and religion, are able to partake in economic growth, we must focus on basic skills. We need to focus on reducing inequalities where they first emerge, within primary schools. Bring reforms and modifications: Reservation system was developed in a different era that we have not had the time or the inclination to think about its success or to examine possible modifications. The system deserves serious re-evaluation. The Reservation system that was put in place during the early years of the Republic deserves serious re-evaluation in an era when technology has paved the way for deploying a better equipped arsenal. Do you agree with this view? Give arguments in favour of your answer. It was launched in 2011 to reduce particulate matter (PM) pollution by 20-30%. It is a programme notified under the Environment Protection Act. Target beneficiaries are the pregnant women who are in the 2nd and 3rd Trimesters of pregnancy. It allows involvement of private practitioners to volunteer for the campaign. Q.3) With reference to constitutional amendment bill, which of the statements given below is/are correct? The constitutional amendment bill must be passed in each House by Absolute Majority. In case of joint sitting, for the purpose of deliberation and passage of constitutional amendment bill, the bill must be passed by a simple majority. Q.5) Which of the following is incorrectly matched?